Comprehensive skills in management, administration, and leadership are essential for occupational therapy assistants (OTA) in their daily interactions with their clients in various health care environments. Inside Management and Administration for the OTA: Leadership and Application Skills, Dr. Karen Jacobs has gathered an expert team of 11 contributors of clinicians, academicians, administrators, managers, and graduate students to address each of the ACOTE Standards with a focus on evidence-based literature and examples of the leadership and management skills needed as an OTA. 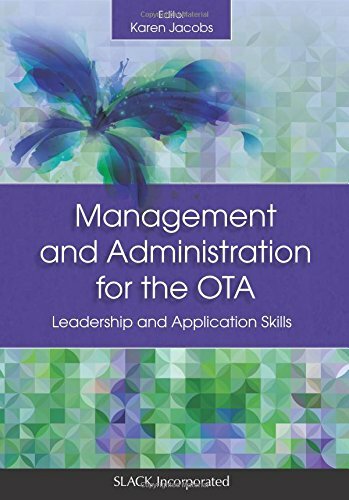 The chapters of Management and Administration for the OTA: Leadership and Application Skills also includes 5 key vocabulary terms and their definitions, case examples relevant to the content, website resources, and multiple choice review questions. Straightforward, comprehensive, and user-friendly, Management and Administration for the OTA: Leadership and Application Skills will provide OTA students and clinicians with an essential resource for their future success.